Volkswagen’s revenue in Russia this year has exceeded those of other domestic car manufacturers. Last year Volkswagen’s revenue increased by 35 per cent and reached 258 billion rubles ($8 billion). The automobile manufacturer sold 316,000 cars in 2012 (11 per cent of the Russian market). Marcus Ozegovich, General Director of Volkswagen Group Rus attributes the growth to a successful strategy. “Our secret is the right strategy. Russians have assessed Volkswagen cars, its wide range of models allows everyone to find the right car – from a family auto to a premium class vehicle,” Ozegovich was quoted by RBC daily. The company’s revenue has exceeded that of Russia’s auto-giant AvtoVAZ for the second year in a row. AvtoVAZ’ revenue last year increased by 4.8 per cent, making the company the third most in-demand in the Russian market. Toyota Motors came second with 226.67 billion rubles ($7 billion) and a 26 per cent growth year-on-year. Volkswagen also links the growth in revenue to a successful strategy of production localisation. In 2007 Volkswagen Group Rus launched a manufacturing plant in Kaluga that currently produces 60 per cent of the cars sold in Russia. Its annual capacity is approximately 225,000 cars a year. 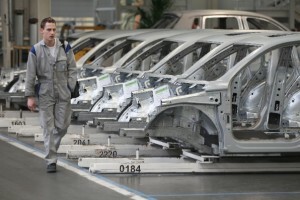 Volkswagen also uses GAZ car manufacturer’s platforms in Nizhny Novgorod for its output. The company plans to produce engines at the Kaluga plant later this year. “Of course there is a factor of consumer uncertainty in the positive development of the market situation. But we are sure that in the long-term Russia is a growing market with huge potential,” Ozegovich believes, adding that the company seeks to expand to a 15 per cent share of the market by 2018, selling over half a million cars a year. Volkswagen Group Rus is the main Partner of the Sochi 2014 Olympics and Paralympics Winter Games. The group sells several brands of cars in Russia including Volkswagen, Skoda, Seat, Audi, Bentley and Lamborghini. Russia’s car market varies greatly from Moscow to the provinces. In large cities like Moscow and Saint Petersburg it is hard to find a Russian car produced by AvtoVAZ as citizens are more likely to purchase foreign branded cars. However, in the provinces AvtoVAZ automobiles are still popular.